I found this man, and other than his hands and feet, he looked and seemed in good health. As best as I could gather these growths began when he was 14 years old, and began in the area of his wrists. 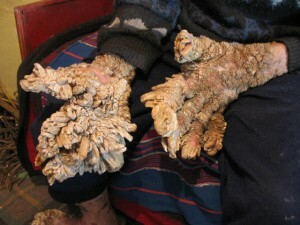 The skin on his wrists and the back of his hands resembles that of a hedgehog – hundreds of spike like growths. The problem is much more severe on his palms and fingers where the growths resemble very much that of nails infected with a fungus. The growths have that same texture, smell and feel. I cut a number of the largest growths off, most of witch did not bleed. Some of the smaller growths did bleed a small amount and he seemed much more sensitive to the cutting of the smaller growths. He has 15 skin tags on his face, and a wart in one ear. Poor guy, how frustrating would it be to not be able to use your hands because of that. I hope it’s not very painful. This post has been circulating the internet as a case of Lewandowsky-Lutz dysplasia. However, there are no reported pictures of this condition to associate the appearance of this condition. It looks more like a PPK or hyperkeratosis, which is an autosomal-dominant disease. These are not macules or papules, so Iâ€™m not really sure this would be considered Lewandowsky-Lutz dysplasia, which is viral. Many times, these conditions have fungal and viral infections superimposed over a genetic hyperkeratosis. It may be more in line with Unna Thost disease. The jury is still out on this rapidly circulating post on the internet. . .
Looks like Unna Thost Disease. Very dramatic pictures. When I see a patient I like to record the case and post it here. And lot of users send me emails when they find something amazing/bizarre/outstanding medical news. Thank you for your kind comment and for your visit. that is one disgusting picture! where do you find all these interesting yet bizzarre stuff? the other time, u had the arm reattachment (groin) one…! !